Now the nights are getting colder, it's worth stocking up on red wines, particularly those that go well with hearty meat dishes. 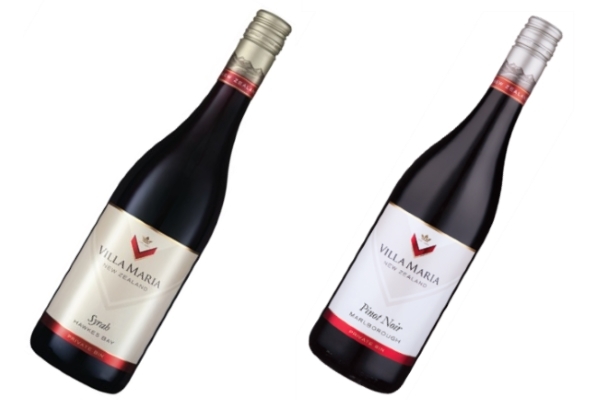 George Fistonich harvested his first grapes back in 1962 and Villa Maria is now at the forefront of the New Zealand wine industry, winning many awards. These two single varietals from the Private Bin range are fine examples of his reds. We normally think of white wines from the Marlborough region but the high number of hours of sunshine, with the land cooled by the ocean, is ideal for Pinot Noir. In 2015, spring was warmer than usual and was followed by a temperate summer. The grapes were aged in seasoned French barriques for 10 months with natural malolactic fermentation. The result is a wine high in aromatics, with sweet cherry and ripe raspberries on the nose. Tasting, you get hints of cinnamon and cardamom with well-rounded tannins. It works well with red meats, smoked salmon or mature cheddar. Stockists include the Co-op, Morrison’s, Asda, Hailsham Cellars, Vino Wines, Temple Wines, Bin 21, Famous Wines and the New Zealand House of Wine with a recommended price of £13.35. This is 100% Shiraz (AKA Syrah) from the free draining soils of the Gimblett Gravels in Hawkes Bay. 70% is matured in a mixture of new and seasoned oak barriques for 20 months before being blended with the remainder. On the nose there are floral wild herb aromas with notes of red plum, smoked bacon and white pepper. Tasting reveals more plum and herb characteristics, and the tannins are silky and smooth. Good with red meats and game, particularly venison, and strong cheeses. Stockists include Wine Rack, Hailsham Cellars, Dylan’s Wine Merchants, Islington Wine and the New Zealand House of Wine with a recommended price of £13.35. Villa Maria has full information about all the wines. Way of St Francis, Italy. Abruzzo & Le Marche, Italy. Honduras & El Salvador, Central America. Vancouver, the Yukon & the Rockies, Canada. Festival of the Oasis, Tunisia. New cocktail bar, The Lucky Pig opens in Fitzrovia. Clarissa Dickson Wright at the Savoy. North Sea Jazz in Rotterdam. Cruising down the Nile, Egypt. Thrills and spills in Tenerife. On the fruit route in South Africa. Lough luxury in the Irish Midlands. Madrid Fusion gastronomy festival, Spain. Learn to ski in 3 days, Austria. Riding the Hudson Bay Express for a date with Polar Bears. Manito Ahbee Festival, Winnipeg, Canada. Forage for wild food in Kent. Wine Festival in La Rioja, Spain. September 7, 2010 Viareggio, Italy. Going round the Big Bend in Texas. Croatia for Starigrad Paklenica Music Doc Festival. Hannover and Cologne - beer and sausages twice. On the Way of St James to Santiago de Compostella. Learning to taste Olive oil. Italian food matters in Abruzzo. Cretan diet is recipe for long life. Cooking up a storm in the kitchen of an Italian Palace. On Yer Bike in the Loire valley. Treading the Tapas trail in Madrid. International gourmet food fair in Spain. Spontaneous eruption of Sun Ra Arkestra. On the Czech-Polish friendship trail and climbing the Snow Mountain. A Breeze in Belize - 3 adventures in Central America. Walking the London Loop, sections 19,20,21 all in one day - phew! The best pizza in Britain expands across the river Thames. Olives are all the same? Not at all and in the South of France they're the best in the world - that's what they say anyway. Greek restaurants get a bad press in London but they needn't just be Moussaka and Kebabs. The Greek National Tourist Organisation is on a mission to educate. Billingsgate Market, in London, sells fish from around the world, but the best is from Scotland, and it's also sustainable. The third annual walking festival took place in Funchal with over a hundred hikers making the best of it. London is one of the most expensive cities in the world and is host to a huge variety of theatre, music and film. Yet it needn't cost anything - find out how to get tickets for free. All Rights Reserved. Designed byRupert Parker using Free CSS Templates.